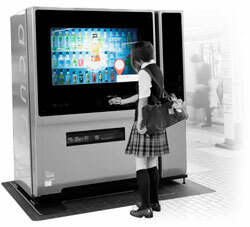 Of late you will see more and more vending machines being replaced by these intelligent touchscreen ones. There is a camera at the top of the machine which recognizes your face and identifies your gender – based on your build, height and other factors, it will make recommendations based on purchases of others who resemble your traits. All you have to do is stand right infront of the machine and after a few seconds a few products will be highlighted for you – try it! It will recommend different drinks for you and your partner. Below is a video taken soon after they were released in Japan with a load of folk taking videos and photos of it – now they are so common that the only people taking photos of them these days are gaijin like me. You dont need to take whats recommended – just tap on what you want and the machine will display a high res image of your chosen drink together with some info to entice you to part with your change. But there are vending machine manufacturers who feel that customers feel more comfortable buying something from a vending machine which they can see as a physical object – introducing another type of touch panel vending machine which has a transparent display – check out the video below. 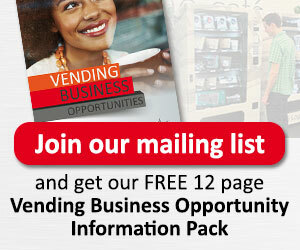 Vending machine mounted screens of various sizes can be used to display advertising. Ultimately leveraging the prime location of the machine to target consumers or inform staff.